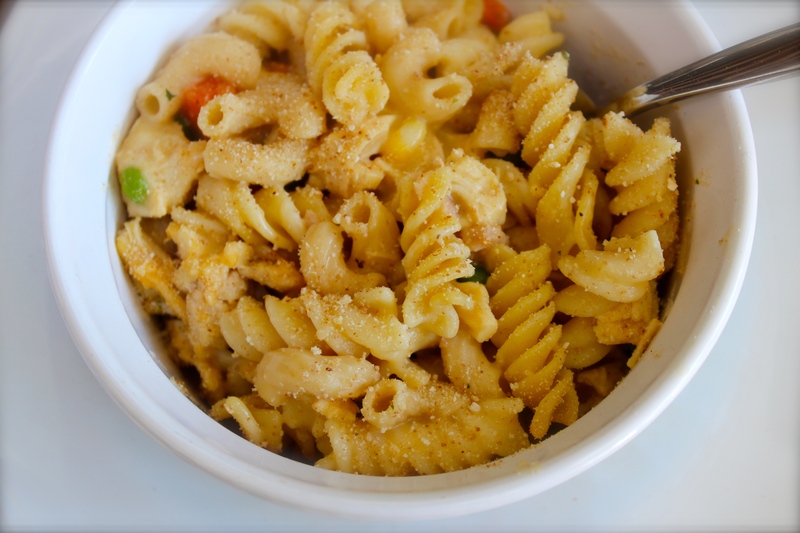 Happiness Project Recipe #62: Creamy Chicken Noodle Bake! Chicken Noodle Soup. Who doesn’t like Chicken Noodle Soup?? No one that I know. We all know that when sickness strikes, chicken noodle soup comes to the rescue. Every single time. But what about Chicken Noodle Soup as a standard dinner option? Even when there’s no little runny nose or no happy slap of rain upon the window pane? What about Chicken Noodle Soup in the Summertime? Yes, you heard this Mama right. Summertime Chicken Noodle Soup. When you’re NOT sick. With a twist! What I love most about this recipe is that it’s both creamy and crunchy, all in one bite. Not at all like a classic bowl of Chicken Noodle Soup. Oh, sure, you’ve still got the cubed chicken and peas and carrots. But this dinner dish is a bit more like a casserole than an actual soup. With green beans, two types of pasta, as well as a lovely layer of bread crumbs. That’s baked. Not just stirred, Which makes ALL the difference. I think so at least. Because the truth? Even when I AM sick, the classic chicken noodle soup sometimes gets a little boring to me. Don’t hate me now, okay? I’m just being real here. So who’s ready for a different spin on Chicken Noodle? Your kids (and dog, too) will love this one! Firstly, prepare all of your fresh pasta and veggies correctly. Set each aside, separately until you’re ready to combine them all. Cut up the cooked chicken breasts into 1 inch cubes. Set aside. Preheat your oven to 350D. Lightly spray a 8×10 inch baking dish with butter. While the oven is pre-heating itself, dump the pasta and can of cream of chicken into a large bowl. Stir until the pasta is roughly combined with the sauce. Now, add in the corn, peas and green beans, stirring until well coated. With the entire bowlful of combined ingredients, spoon out into the prepared baking dish. Lightly dust the top of the dish with panko bread crumbs. Pull the dish out of the oven and let cool for a few minutes before serving. A yummy Chicken Noodle Bake that everyone will enjoy. Even your furry kids. Must never forget our furry kids. « Happiness Project Recipe #61: Strawberry Field Summer Salad! This sounds delicious! I will have to try this! Looks Yummy! Will have to try it out soon! uh, I’m a sucker for Mac n’ cheese! & this recipe looks soooo good! This looks super yummy. I am sure my kids would eat it as well. I will have to make it. Thanks for sharing! We love noodle bakes and can’t wait to try your recipe!